MikuMikuDance, and upload it to YouTube! Goedendag (good day) LearnMMD readers, I am parkeerwacht a Dutch MMD’er and I am new here on the team. I was wanting to share my techniques, for creating HD 60 FPS MMD videos and uploading them to YouTube. Since YouTube supports 60 FPS videos these days, you must have seen a lot (or at least some) of MMD videos being uploaded in 60 FPS. (FPS stands for Frames Per Second, for the people who don’t know.) If you are like me and thought: Well why not set the frame-rate to 60FPS in MMD’s render options and you’re done, right? Well this is not everything you have to do. If you don’t use proper codecs and settings, the end result may be at a low quality. In this article I will be explaining how I render in 60 FPS step by step. Step 1: Create an MMD animation. Load up MMD and make your animation. It can be anything you like. It doesn’t matter for this tutorial. But for this Article I will be using my latest MMD video I uploaded to my YouTube channel. You can watch it at the bottom of this page. What? You don’t know how to create an animation? Step 2: Let’s talk codecs. So which codec should I use? Choosing a proper codec is what a lot of people forget when making videos in general (not just MMD). You may think it is as simple as picking any codec that you like, Right? Well this may turn out ok. But I have found a codec called Ut Video. Ut Video is a lossless codec, which means that whatever goes in, comes out. A lot of codecs are “lossy”, this means that there is quality loss after encoding. YouTube also uses a lossy codec. The nice thing about this codec is, that it is both 32-bit and 64-bit. 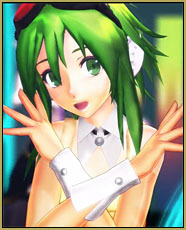 This means that this will work in 64-bit MMD. Most codecs I tried before only worked in 32-bit. So I had 2 MMD versions running. (64 and 32 bit) This codec is also fast at encoding 60 FPS video. Ok so, where do I download this codec? UPDATE: 29-04-2016: Due to a bug in Ut Video, the audio may get out of sync at some point in the video. A workaround is to lower the screen size in MMD, if you run into this bug. Rendering using this codec doesn’t differ from any other codec, except that you have to change some settings. Choose where you want to save your video file. Set frame-rate to 60 FPS. Select UtVideo YUV422 BT.709 DMO as compressor. 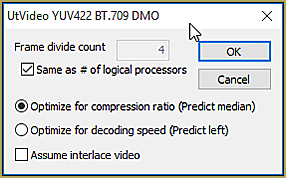 NOTE: YouTube prefers 4:2:0 subsampling to be uploaded, use YUV420 BT.709 DMO for faster processing by YouTube. Then click on OK to render. When using this codec make sure you have at least 40GB of free hard drive space. This codec outputs very large files. 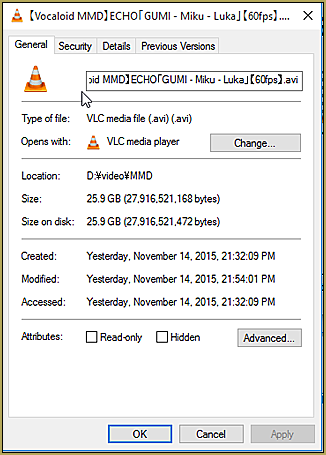 As you can see in the image this video is almost 26GB large. Step 4: Transcoding the video to upload it to YouTube. Be sure to include 60 FPS in the title of your video, this will tell people who browse YouTube that your video is 60 FPS. Make sure to playback your video after rendering from MMD. If you use VLC, you can’t play it back. VLC also doesn’t support the codec. Use Windows Media Player instead. Do the same when you are done with transcoding. Why go through all of these steps? The reason for using this method is that, this way, you prevent YouTube from destroying your video after processing. It is also because direct H.264 codec in MMD 32 bit makes MMD crash (at least for me) This is because this codec doesn’t work well with the AVI format. If you have any tips/suggestions, if you have used this article to render your videos, if you have any questions or if you have another method of processing your 60 FPS videos, please tell me in the comments. I like to answer questions and I am open to feedback. This article was inspired by this post from Trackdancer on Deviant art I was browsing through his DeviantArt when I saw that post. You can read through some MME effects noted there but I was mostly interested in the codec. So, this covers what I have discovered about rendering in 60 FPS in MMD. Can someone help me when i go to record the mmd the quality is good but the model itsnt moving or is moving really slow and the music wont play or the quality is trash and everything else is great it seems like i get either one or the other. Please give us a list of the steps you take and what happens. We cannot tell what the issue might be without some exact details from you. Also, describe your computer… desktop, laptop… Win 10? 64-bit? Graphics card? MMD 9.31… is it the 32- or 64-bit? MME version and is it 32- or 64-bit. Any effects you use that cause an issue? … There are so many variables. You must explain carefully in detail… we must “see” what you see before we can get a handle on your issue. Hey, I’ve been fiddling with my PC for hours and scouring the internet but I cannot find a solution for this anywhere. I have been getting stuck with the “Could not connect pVideoOut to compressorin” error when I try to render with the Ut Video encoders, and when I try to render with any other endcoder, I wind up getting just a green video. The green one is not a big deal, since I never really use anything but Ut. 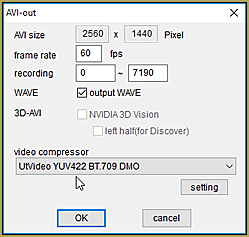 Last night, I used 2560×1440 at 60fps with a UtVideo YUV420 BT.601 DMO encoder, and everything worked out fine. This morning I tried to re-render with a different resolution (2560×1071) and found MMD giving me the error. The error manifests when you hit the render button, but rather than MMD closing like it normally would, another window opens identical to the one you would see when rendering. This window stays open as a small dialogue box opens warning you of the error. I proceeded to check and ensure all my drivers were up-to-date, as well as my windows 10. Everything is updated, but the issue persists. I reloaded MMD to a fresh state with no models/stages/effects loaded and tried to render with the same encoder, but to no avail either. I have tested every UtVideo encoder that comes with the pack, but nothing is working. I was wondering if anyone has any solutions, because it seems my search has been pretty fruitless. I do not know what’s going on… and have never seen MMD render as all green… but I do know that MMD does not like to “Render to Picture” to a size larger than you monitor’s resolution… I wonder if that’s an issue when rendering to AVI? You are being very demanding with your huge screen-size and 60fps. … What happens if you render to a smaller size… 854×480… YouTube’s recommended 360p size… will MMD Render to AVI at that level? If so, we may have learned something. Oh man, thank you so much for replying and for the suggestion! It did turn out to be what was necessary to get things back up and rendering properly. It appears that, at least for me, the issue was the resolution. However, I don’t quite get why now of all times it decided to give me issues. I have rendered at 2560×1440 before with Ray-Cast shader and received no issues. The only difference this time around was my use of custom normal maps and .fx file settings. My computer handles it very well (I average about 45-50 fps when idling with everything loaded or playing). It leaves me kind of stumped, honestly. You would expect it to have no issues rendering. I don’t mind turning down the resolution, though. Thank you so so much for the help! Awesome… great that we got you going! Thanks for letting me know it worked! I have also learned, today, that when rendering to AVI, the screen size needs to be even numbers… not an odd number… so that might be why 2560×1440 worked but 2560×1071 did not.